The Himalayas, or Himalaya (), form a mountain range in Asia, separating the plains of the Indian subcontinent from the Tibetan Plateau. 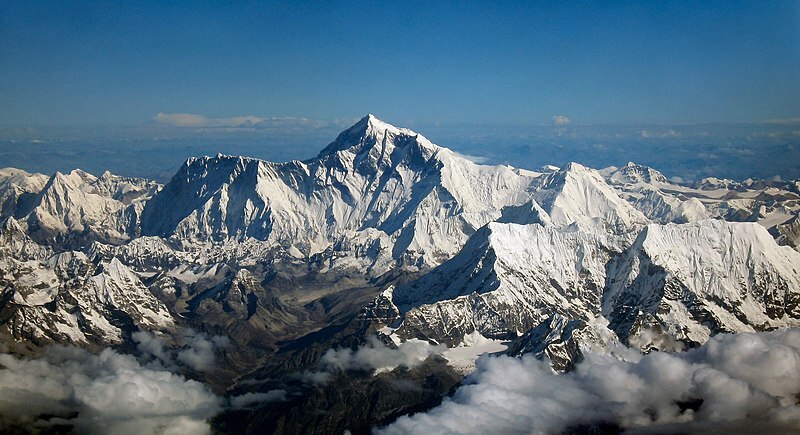 The range has many of the Earth's highest peaks, including the highest, Mount Everest. The Himalayas include over fifty mountains exceeding 7,200 m (23,600 ft) in elevation, including ten of the fourteen 8,000-metre peaks. By contrast, the highest peak outside Asia (Aconcagua, in the Andes) is 6,961 m (22,838 ft) tall. Lifted by the subduction of the Indian tectonic plate under the Eurasian Plate, the Himalayan mountain range runs west-northwest to east-southeast in an arc 2,400 km (1,500 mi) long. Its western anchor, Nanga Parbat, lies just south of the northernmost bend of Indus river. Its eastern anchor, Namcha Barwa, is just west of the great bend of the Yarlung Tsangpo River (upper stream of the Brahmaputra River). The Himalayan range is bordered on the northwest by the Karakoram and the Hindu Kush ranges. To the north, the chain is separated from the Tibetan Plateau by a 50–60 km (31–37 mi) wide tectonic valley called the Indus-Tsangpo Suture. Towards the south the arc of the Himalaya is ringed by the very low Indo-Gangetic Plain. The range varies in width from 350 km (220 mi) in the west (Pakistan) to 150 km (93 mi) in the east (Arunachal Pradesh). The Himalayas are distinct from the other great ranges of central Asia, although sometimes the term 'Himalaya' (or 'Greater Himalaya') is loosely used to include the Karakoram and some of the other ranges. The Himalayas are inhabited by 52.7 million people, and are spread across five countries: Nepal, India, Bhutan, China and Pakistan. Some of the world's major rivers – the Indus, the Ganges and the Tsangpo-Brahmaputra – rise in the Himalayas, and their combined drainage basin is home to roughly 600 million people. The Himalayas have a profound effect on the climate of the region, helping to keep the monsoon rains on the Indian plain and limiting rainfall on the Tibetan plateau. The Himalayas have profoundly shaped the cultures of the Indian subcontinent; many Himalayan peaks are sacred in Hinduism and Buddhism.